Under ideal circumstances, the nasal septum is perfectly straight and located precisely in the middle of the nose, which makes both sides of the nasal cavity equal in size. Unfortunately, this ideal situation is seldom the reality. More than 80% of the population has some degree of deviation or crookedness of the nasal septum. The septum is usually straight at birth and remains straight throughout childhood. However, as a person ages, the septum has a tendency to bend to one side or the other. Sometimes the septum is bent as a result of birth trauma. Although trauma may be a factor in producing septal deviation during childhood or adult life, in many cases, there is no history of injury to account for the irregularity. How is Septal Surgery performed? 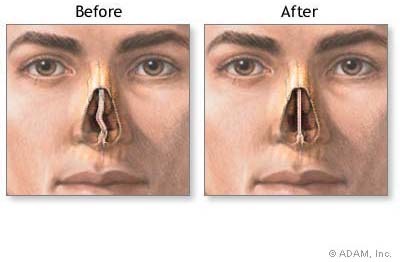 Septoplasty is performed under general anesthesia. It is extremely important not to eat or drink anything eight hours before the surgery. Otherwise, the operation will have to be postponed to avoid risk to the patient. This surgery is performed entirely through the nostrils – no incision is made in the skin. The doctor makes an incision inside the nostril through which the mucosa (the thin membrane lining the septum and nasal cavity) is lifted up so the bone and cartilage of the septum can be seen. The surgeon removes or reshapes the deviated portions of bone and cartilage, then returns the mucosa to its original position and sutures the incision. After the effects of anesthesia have worn off, the patient is discharged to go home. At Los Angeles Sinus Institute, Dr. Zadeh implements a distinctive approach to nasal and sinus surgery, using the safest, most advanced, and most minimally invasive techniques. He focuses on cutting-edge techniques and treatment options to maximize outcome and minimize risk for our patients. Because septoplasty surgery is performed under general anesthesia, you will sleep during the operation and spend about an hour in the recovery room afterwards to allow time for you to wake up. Most patients feel well enough to go home an hour after septal surgery. You can expect drainage from the nose that is red in color after the surgery. The volume of drainage will decrease and the color will lighten over the few days following the surgery. You may have a minimal amount of blood-tinged drainage for approximately 10 to 14 days. As with most surgeries, septal surgery causes swelling of the tissue in the nasal cavity, which can produce a feeling of congestion and fullness in the nose and sinuses. This swelling is temporary, and the congested, stuffy feeling will subside over time. To help prevent bleeding, do not blow your nose for 14 days after the surgery. You may gently sniff back any nasal secretions. After your first post-operative office visit, you will flush your nasal cavity with a saltwater solution we prescribe for you. If you need to sneeze, do so with your mouth open. It is important to avoid any strenuous activity for 2 weeks after septal surgery. Avoid bending over and lifting anything weighing more than 20 lbs. It is acceptable to take a gentle walk for moderate exercise. Sleep with your head elevated with at least 2 pillows to help reduce nasal congestion. A deviated septum does not always require surgery. 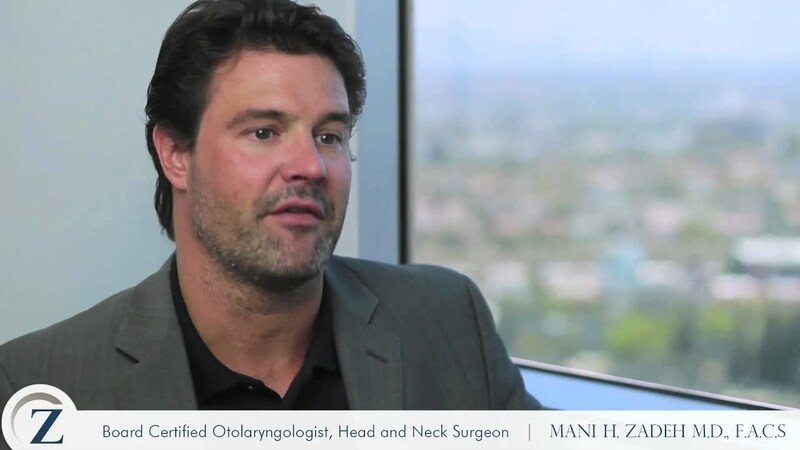 Most people have some degree of a deviated septum and experience few to no symptoms. However, for many, it can severely impact daily life, decreasing your ability to exert yourself physically, sleep soundly, or even just breathe normally. If you find that you are consistently struggling to breathe through your nose, have experienced chronic sinus infections, headaches, nosebleeds, or are having trouble sleeping due to struggling to breathe comfortably, surgery to correct a deviated septum may be the most effective treatment. What are the Risks and Benefits of Septoplasty? There are many benefits to septoplasty surgery. Patients have experienced less restriction in breathing passages and minimal to no stuffiness, which leads to fewer headaches. Many people experience a remarkable level of improvement in the ability to sleep soundly. Septoplasty is considered safe; however, as with any surgery, there are some risks. Complications can include temporary numbness, post-surgery infection, bleeding or a decrease in the patient’s sense of smell. It is important to review any previous health or medical issues with Dr. Zadeh. It is not recommended that you return to work immediately. The first two days after septoplasty surgery should be set aside to rest and recover. Pain can be managed with prescriptions, which might leave you feeling drowsy and lightheaded. You will start to feel much better on day three. Over the counter medications can be used when needed. Septoplasty surgery requires about one week of recovery, and missing workdays. Those who work in more physically demanding jobs, including those with heavy lifting or vigorous motions will require more time off work. Most patients do not need an overnight stay and can recover in the comfort of home. You will need to have a friend or family member drive you home and stay with you for the first 24 hours post-surgery. Although not common, hospitalization might be required for any patient that has certain health conditions that could pose a higher risk. Will Surgery Cure My Snoring? Snoring can have many different root causes and alone, is not a good reason to elect to have septoplasty surgery. You are a unique individual – with a unique physiology. If you have trouble with snoring, we can help – which may or may not involve a septoplasty, or any surgery. The only way to know is to evaluate your individual condition and nasal structure to discover why. If you have a deviated septum and suffer from obstructed airways, nosebleeds, headaches, snoring, or sleep apnea, septal surgery may be the most effective and appropriate treatment for you. The first step toward obtaining relief is to schedule an initial consultation at Los Angeles Sinus Institute. Based on personal examination, discussion of your medical history, and review of your CT scan (if available) Dr. Zadeh can determine if you are a good candidate for corrective septoplasty. See if our deviated septum surgery is right for you.